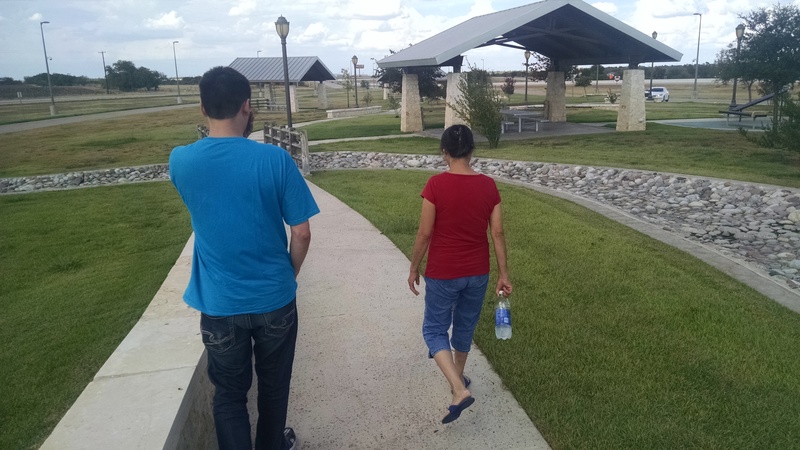 Great Lessons Learned on a Family Trip | My Health! My Choice! This week, my son has been home from Colorado and we went to visit family in Fort Worth, TX and North Eastern Oklahoma (also known as God’s country). The trip was a great deal of fun and my wife was beside herself getting to spend so much time with our son. I always joke that, “I know my place in the family. My wife keeps me around in case she needs to sell me to buy our son shoes.” We all loved the trip, and I learned great lessons to share here. As I shared last week, I was a bit apprehensive about the trip, wondering how I would stay on program eating meals prepared by various relatives, as well as eating on the road. I prepared in advance before going. I also set myself three goals in order. To stay in fat burn. If knocked out of fat burn, to keep carbs low enough to prevent carb cravings. If knocked out of fat burn with no choice but to eat excessive carbs, to not eat enough to gain weight. I didn’t really expect to lose any weight during the week. I would have been happy with just being 274 lbs. as I was the previous week. For one, I would be spending long hours in the car not really moving. My UP 24 kept vibrating telling me to get up and do some activity—hard to do at 80 mph (yes, I drive 80; this is Texas so don’t judge me). Also, I would need to stop for food for my wife and son. I chose to switch over to a 4&2 system of eating so I could enjoy more meals with the family. This means that instead of one Lean & Green meal and five meal replacements a day, I would do two Lean & Greens to enjoy eating with others and four meal replacements. We also carried some olives (yum!!!! ), pickles and almonds in case I wanted snacks. I didn’t limit these exactly, and never was able to make all my scheduled meals. During the trip I was knocked out of fat burn twice. We left on Wednesday and came back home on Saturday. Wednesday night, I ate some food that I didn’t know had added sugar until I had already eaten it. That night I could feel my energy levels drop and knew I was out of fat burn. The next day (Thursday) on the way to Oklahoma, we stopped for some “Mexican” food. I didn’t catch the beans and rice in my meal until I had eaten half of it. Since I had already been knocked out of fat burn I went ahead and finished it and thought I would work to get back in when I got home. I decided to just watch my eating the rest of the time to keep down carbs without much thought about fat burn. I wasn’t going to let obsessing over my diet ruin the fun with my family—that is not a lifestyle; that is a chain. I was sitting in the restaurant with my son and my Uncle. Now understand, my Uncle is the kind of man that when he speaks, you listen because it will be worth more than gold. So I was really listening to him when I started eating my meal. I ordered a taco salad. I saw the Spanish rice—which I forgot to ask about—and, while avoiding it, didn’t notice the refried beans until I had already eaten them. Sure enough! When I checked later, I was totally out of fat burn, again! Back to just paying attention to carbs until we got back home. The next morning, when I checked with my Ketostix I was surprised to find myself back into pretty healthy fat burn. Since Saturday was on the road, where I could pretty well control what I would eat, I stayed on program and did well the rest of the day. Now back home I am religiously on program again. The lesson I learned was to not give up when things beyond your full control torpedo your program. I also verified that one does not have to put a lot of pressure on friends and family to conform to your dietary needs—unless it is an allergy, of course. Some of my family would ask about my needs. I would answer and some would seem to get uptight and worried about fixing the wrong foods. I simply told them, “Don’t worry about it. My diet is mine, not yours. If I can eat it, I will; if I can’t eat it, I’ll pass.” They all did wonderfully and really were caring about it. Everyone was excited to see how much I had changed. It also felt great to be able to have the energy to go down to the ditch and shoot my handguns and rifle. To walk over and see my uncle’s soy bean field. I also had enough energy I was tempted to sneak off one evening and see if I could shoot a nice fat wild hog. I decided not to. I figured my wife wouldn’t be very tolerant of hauling the smelly thing home in the car. Each time I fell off of fat burn it was tempting to just give in and eat whatever—pasta, bread, potatoes, etc. However, I had already set goals. The first didn’t last long, but I could hold to the second and control my carb intake. I stuck with this, hoping (almost beyond hope) that I would at least not gain any weight. This morning when I weighed in I was shocked. I was hoping and praying that I was at least no heavier than the previous 274 lbs. 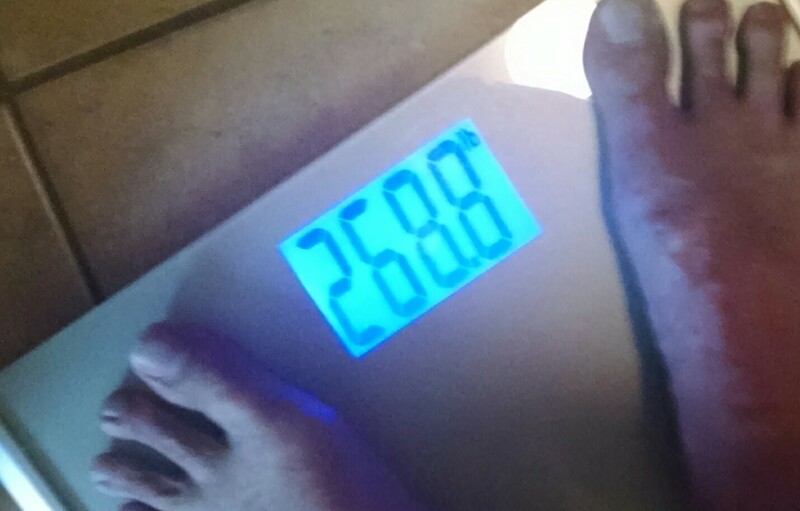 I was blown away when I looked down and the scale said I was down to 268 lbs. In a week that I fell out of fat burn twice and ate far more than I probably should, I lost almost six pounds (I was actually 268.8). How did this happen? I credit it to three things. One, I was fairly active when we were there visiting—it was hot enough I probably sweated out a good pound or more. Two, though many things were off plan I still kept down the carbs and bad stuff. Three, (sorry to preach the same sermon again) I stayed properly hydrated. For this last I have to share the second best investment I’ve made in my health. The first was the program itself. The second best investment was a water bottle purchased from Walmart for this trip. 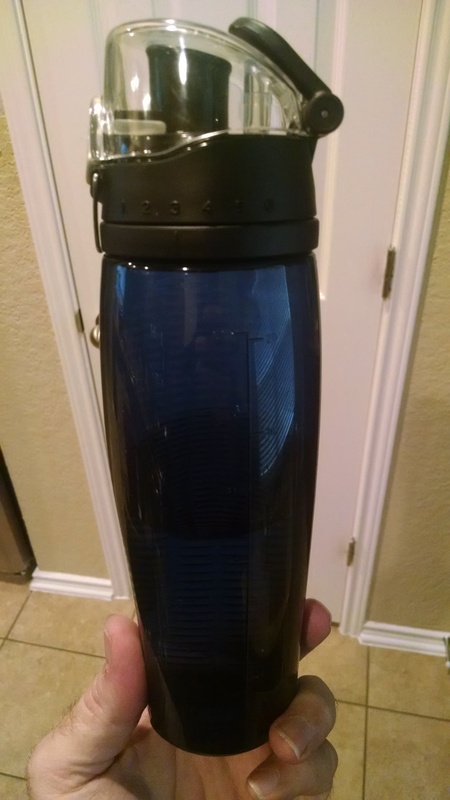 It holds 20 ounces, so I need seven of these a day for proper hydration. The bottle has a numbered ring so I can track my water consumption. On the trip I would buy gallon jugs of water and just keep refilling the bottle. It was never more than a few feet from me most of the trip so I could stay hydrated. If I had to be away from water for any length of time (such as when visiting one museum) I would drink the full 20 ounces when I got back to it. Stay hydrated, at all cost. Don’t obsess and drive others crazy. Just take life as it comes and make corrections as needed. If something happens beyond your control, or a mistake happens, don’t throw up your hands and surrender to the temptations to eat whatever.